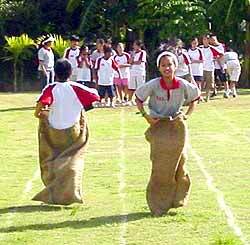 2004 Sports Day at Nakorn Payap International School (NIS) was a “resounding success,” said P.E. Instructor Lee Stevens, as Grades 1 through 12 swam, ran and jumped in various events throughout the day. Fun leads ... even here! Fun is the name of a student! Despite 40 degree temperatures, students enjoyed the new NIS gymnasium and swimming pool with competitors striving to win points for their respective teams. In the primary school it was the Blue Team that took top honors after a sack race, a three-legged race, an egg-and-spoon race, a kickball game and various swimming events. In the secondary school it was the mainstream students who prevailed over their ESL counterparts. “In futsal, it was very close, with the girls’ high school winning 4-3 and the boys’ 7-5,” Lee Stevens noted. The futsal competition was useful in light of this week’s International School Futsal Tournament in which all the Chiang Mai International Schools will compete. Sports Day was an effort by the entire school, with all teachers involved as starters, judges or monitors, while all students participated. The Japanese business community turned out in full force last Sunday, having invited their Thai counterparts and friends to a round of golf. The annual friendship golf tournament took place on the grounds of the Chiangmai-Lamphun Golf Course. A total of 180 participants took part in the competition, which teed off at 7 a.m. sharp, and it took them a little over five hours to complete the beautifully designed, scenic course. 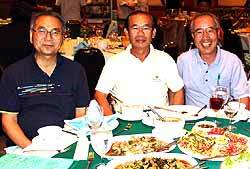 (From left) Katsuhiro Shinohara, the Japanese consul general, Dr. Sukhum Sukapanpotharam, MD of the Chiangmai Lamphun Golf Course, and Mitsuo Sato, president of the Japanese Society. Accompanied by a light breeze the whole time, the majority of players were satisfied with their performance, although some admitted that they “have seen better days”. The amicable yet competitive mood was easily transferred into the ballroom where lunch was served, and no time was wasted as the lucky draw began. Because of the generosity of the sponsors, too many to mention here, every player received a prize, ranging from golf balls to wristwatches, DVD players and a great number of other useful items. 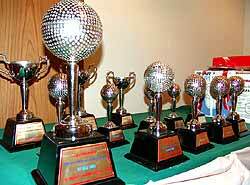 Everyone was keen to receive one of the impressive trophies. In his usual light-hearted address, the recently appointed Japanese Consul General Katsuhiro Shinohara expressed his satisfaction with this enormous turnout, which showed the existing excellent cooperation between the Japanese and local community. He emphasized that funds raised from this tournament will, as before, be handed over to the Chiang Mai Governor’s Office for distribution among local charities. Replying on behalf of the participating Thai players, Somsak Vanichkaiorn, vice-president of the Chiang Mai Chamber of Commerce, said that it was good to see a 50-50 balance between the Japanese hosts and local participants, and that a good game of golf can improve not only business relations but also friendship and goodwill. He hopes that the next tournament will have a record-breaking 200 participants, although this would then become a real challenge in view of accommodating such a great number of players. For an unforgettable golf holiday, the north of Thailand offers tourists and visitors alike traditional cities rich in history, culture, handicrafts, Buddhist temples and natural environment. However, as well as various entertainment centers, shopping arcades, international restaurants, outstanding hotels and an exciting nightlife, Chiang Mai, Chiang Rai and Lampang provide golfing attractions that rank among the best in the world. 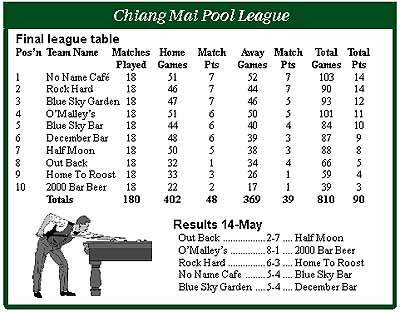 If you decide to play golf during your holiday, you have a choice from one of the following golf courses of Chiang Mai. This championship course designed in 1990 by Dr Sukhum Sukapanpotharam is situated in the heart of a beautiful valley and only 30 minutes east of Chiang Mai. It is an 18 hole, par 72, 7,022 yard masterpiece and meanders through a breathtaking landscape, including a mature forest and refreshing streams, ponds and lakes. This golf course was the official venue for the 18th Southeast Asian Games in 1995 and also hosted the Thailand National Games in 2002. The green fee is 1,600 baht, with a 200 baht caddy fee and 600 baht for a golf cart. Designed in 1995 by the two golfers - five times British Open winner Peter Thomson and Michael Wolveridge, the 18 hole, par 72, 6,900 yard parkland style golf course is located 40 minutes north from Chiang Mai in the foothills of northern Thailand. The golf course offers panoramic vistas of distant mountains. The design uses elements from a British links style course, including rolling fairways, pot bunkers and closely moved areas around the greens. The green fee is 1,000 baht, with a 200 baht caddy fee and 600 baht for a golf cart. Only 10 minutes north of downtown Chiang Mai, this golf club is one of Thailand’s finest. Established in 1974, the lovely 27 hole course, adjacent to Chiang Mai’s horse race track, offers three distinctly unique design styles, with a full view of Doi Suthep Mountain and its temple in the west. The golf course winds its way through huge impressive trees, skirts some large lakes and ponds until it criss-crosses numerous streams and canals. The green fee is 800 baht, but more on weekends like most other golf courses. The caddy fee is 150 baht and for the golf cart 600 baht. Situated in the lowlands only 20 minutes north of downtown Chiang Mai, this Dennis Griffiths and Associates 18 hole championship course was established in 1990 and offers 7,200 yards of wide open fairways, though with water hazards on every hole, plenty of bunkers and trees. The green fee is 1,400 baht on weekdays and 2,300 baht on weekends and public holidays. The caddy fee is 200 baht, while the golf cart is 500 baht/pax. There are three other golf clubs in Chiang Mai, which are far more economical, but they offer just nine hole courses. These are the old Gymkhana Golf Club, the relatively new Mae Jo Golf Club and the Air Force Krung Bin 41 Golf Club. Phrae province is to host the 34th Region 5 Sports Competition, “Phrae Games 2004”. Sophida Potchana-nurath, Phrae public relations officer, announced that the province will host the event that will run from July 2-11. Provincial Governor Somsak Boonpluang, accompanied by his deputy, Phitsanu Sawasdee, called a meeting of the working committee for the Phrae Games in Phrae’s City Hall, for a progress report on preparations for the competition. Issues such as the readiness of sporting venues, accommodation for the athletes, the availability of equipment and the opening ceremony were discussed. Athletes from 15 provinces of the northern region - Chiang Mai, Chiang Rai, Phayao, Lampang, Lamphun, Mae Hong Son, Nan, Uttaradit, Phetchabun, Sukhothai, Phitsanulok, Tak, Phichit, Kamphaeng Phet and Phrae - will compete in 28 codes in the sporting bonanza. Stadiums in Phrae and other nearby provinces will be used. The official opening ceremony will take place at 5 p.m. on July 2 at Phrae Sports Stadium. It will be broadcast live on the Radio and Television Thailand, Channel 11, by the Government Public Relations Office. CH3, the oldest hash club (males) in Chiang Mai is picked up from the Fish & Chip Shop, Ratchawitti Road (opp. Irish Pub) at 16.00 once every 2 weeks. Pick up can be arranged from Fish and Chips shop as well. CUMH3 is a male hash which runs from the Fish & Chip Shop, Ratchawitti Road (opp. Irish Pub) every consecutive (from CH3) Tuesday. Pick up is at 16.00.